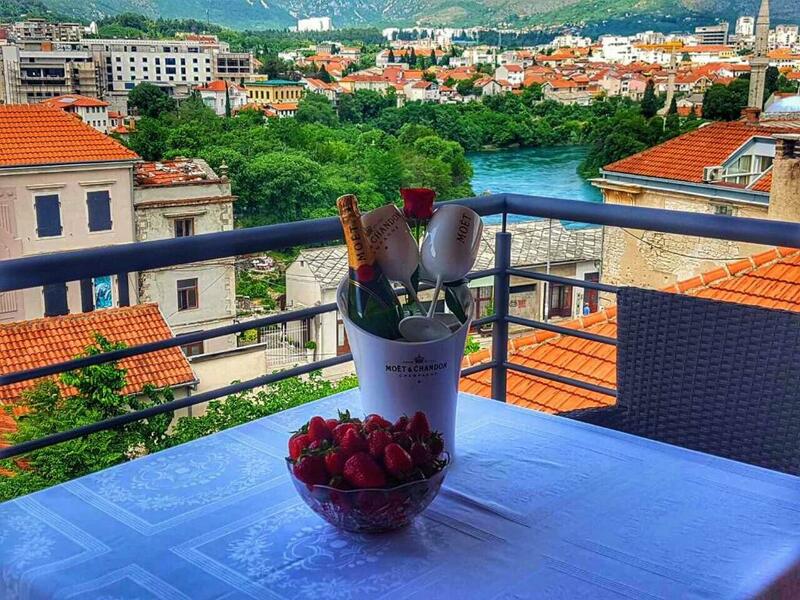 There is no better place to stay in Mostar! The famous bridge is just across the street. Clean and nice apartment with incredible views. The host was so kind and helpful. The location was second to none. The view was just awesome. Too large space inside the apartment. Everything is so pure and fragrant. The large balcony offers views of the old bridge and the old town, the Neretva River. I think there is no better place to stay in Mostar, considering the price and quality that this apartments provides. The location is excellent. Though it is not in the old town but just crossing the road is the way to Stari Most (old bridge). Easily find public parking space (free on weekend) but if your car is not big, you can park at the property. The property is an apartment which is comfortable and clean and smelled so good when we arrived. The owner is very kind and helpful. She would help you with everything about information you need. New appartment house very convenient located just next to the renewed old bridge and the bazzar are. Yery nice welcome with delicious bosnian cake. It's a brand new apartment with extremely big room and hospitable host, everything is so great and you're just 5 min away to the old bridge and main street by walk, I'll highly recommend to stay here. Spectacular view. Very close to the bridge. Very friendly host. Lock in a great price for Inn Town - rated 9.9 by recent guests. One of our top picks in Mostar – and a guest favourite. Providing garden views, a garden and free WiFi, Inn Town features accommodation ideally set in Mostar, within a short distance of Old Bridge Mostar and Muslibegovic House. Fitted with a balcony, the units offer air conditioning and feature a flat-screen TV and a private bathroom with bidet and free toiletries. A fridge and kettle are also offered. Kujundziluk - Old Bazaar is a 1-minute walk from Inn Town, while Mepas Mall is 1.4 miles away. Inn Town has been welcoming Booking.com guests since 10 May 2018. When would you like to stay at Inn Town? This apartment has a private entrance, balcony and cable TV. This apartment has a sofa, balcony and electric kettle. This apartment features a private entrance, patio and balcony. This apartment has a flat-screen TV, seating area and balcony. House rules Inn Town takes special requests - add in the next step! Inn Town accepts these cards and reserves the right to temporarily hold an amount prior to arrival. Please inform Inn Town in advance of your expected arrival time. You can use the Special Requests box when booking, or contact the property directly with the contact details provided in your confirmation. Even though the room was huge, but there was no kitchen and washing machine inside. For us it's more like a hotel not an apartment, but this was not a big problem. Still like the property though. Warm welcome, clean and very good accommodation! There is no lift (understandable for a small house), but be prepared to carry the luggage a little bit. 1 min walk to old bridge. Private parking spaces (very important as street parking in Mostar is not quite safe). Good WiFi speed. And most importantly, Maida is the most helpful hosts we have ever met. My wife’s handbag was stolen in a very popular cafe overseeing the bridge. The cafe owner was cold and unmoved of the crime happened in his cafe and even asked for €15 just for a 10 mins drive to police station. Instead, Maida accompanied us to the police station twice to file the report (a long and painful process) and allow us to stay in the apartment after the check-out time. Having dish soap for guests to wash their dishes would be wonderful. Paper towel would be helpful too. Perhaps a regular coffee maker, or, turkish tea pot would be good too. I would also recommend stocking a wine bottle and regular bottle opener too. Thank you! Maida was a wonderful host. She greeted us in person and answered all of our questions. She also personally checked us out and processed our payment. The location is PERFECT in every way - only 3 minutes walk to the bridge and the old town area - an incredible value for the location. Tip - make sure to contact Maida for how to find their location, the best way to drive in to town, and where to park. The building and apartments are brand new. I recommend an upper level apartment as your view will be better than the lower level apartments (if available). Everything is within walking distance. It was DEFINITELY worth staying for 2 nights and having a full day in Mostar. Make sure to visit Cafe De Alma in the old town and ask for Yaz - he'll teach you all about Bosnian coffee, how it is made, tell you about his family - it's a wonderful experience (only 2 euro / person for a fun coffee experience). Thank you Maida for hosting us - it was a wonderful stay - we recommend this location for everyone!